For this weeks AiFactory challenge we used a calendar from the AiFactory store. We made them into something 3D. I made a spiral pop up card for my challenge using the birds in the calendar. Check out the challenge blog and play along and join the AiFactory Community and meet others. If you have never used or want to learn how to use digi's, then visit for ideas, tutorials and friends. You can see the other design teams cards by visiting their blogs too! 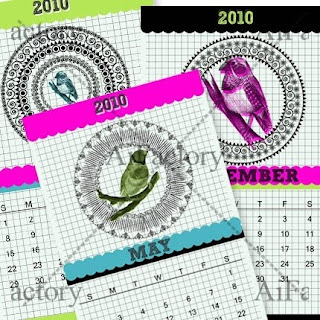 Here's the calendar we used. It's awesome! Be sure to visit the AiFactory Store for all things digital. WOW, this is soooo cool! Great 3D card!! Bravo!! !